When did I fall in love with this wild and beautiful spot……. It’s difficult to say, as I was lucky enough to spend time at the cottage from pretty much the moment I was born (1966), when this special place, built by my father, was the only building on the north side of the road beyond the (long gone) Craigard Hotel. Having so much freedom to roam throughout my childhood, I formed a deep appreciation of this outstandingly beautiful area. 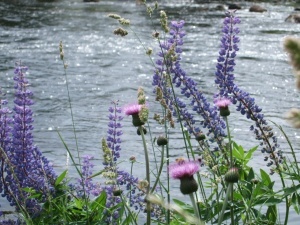 A haven of tranquility when I continued to visit whilst a biology student in the big city (my chosen subject no doubt influenced by the wild beauty of Strathspey and the Cairngorms! ), and a place I wanted to share with friends, whether for exploration, the peace, mountain action or just simply for a wee Highland Gathering (August BoGFest became legendary amongst friends……. for the right reasons, I think!?!). Linda, my wife, and our 2 children also took up my enthusiasm for the countless treasures of this uniquely beautiful area. 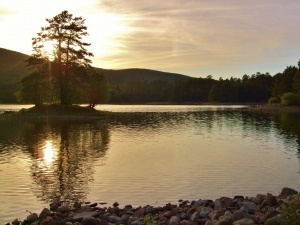 Others clearly thought it was a special place too, as Strathspey became an integral part of the Cairngorms National Park in 2003. Watching our children, and our friends’ children, experience the same freedom and opportunity for adventure that I had growing up has been a real joy. After 3 generations of use by the “clan”, the time has come to share it with others too! However, we have made a few upgrades for guest’s comfort and enjoyment since you had to chip ice off the windows on a winter morning!! A true labour of love, started in 2013 and completed in September 2017. I have no doubt you will leave this magical area viewing the natural world in a totally different way! 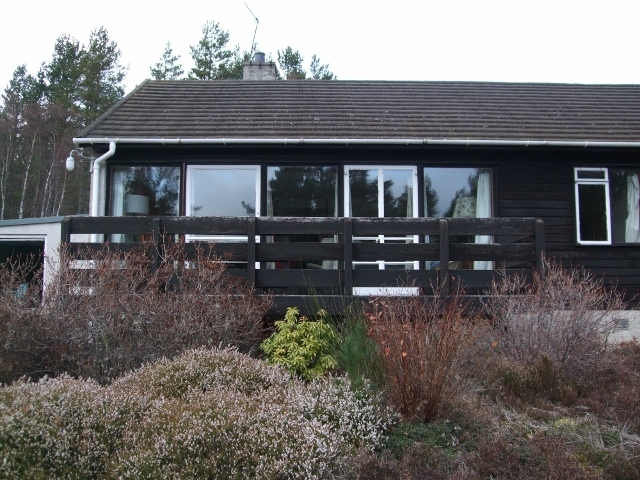 Glencoldon Cottage provides self-catering accommodation within the Cairngorm National Park. In addition to ensuring that visitors have the most enjoyable and memorable visit possible, the owners believe that, in an area of such outstanding natural beauty, it is essential to achieve this whilst also delivering environmental, social and community benefit. We recognise that many of the activities we undertake to prepare or run the accommodation have a range of potential impacts on the environment, and may also have local economy and community implications. We therefore understand our responsibilities in delivering positive outcomes in these areas, and are committed to continual improvement. 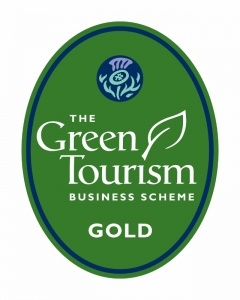 Participation in the Green Tourism Business Scheme, the world’s largest sustainable certification programme of its kind, will help ensure ongoing progress. We are incredibly pleased that our efforts to “build in” best practice / technology during the renovation and set-up achieved us a Gold Award. If you would like further detail of our commitment to achieving sustainability, please access our Sustainability Policy, but, essentially, the need to update and upgrade the cottage for future guests provided a fantastic opportunity to build in many environmental / low-carbon technologies for the future running of the property, as well as ensuring the construction itself was undertaken in a manner sympathetic to the local community, economy and wildlife. 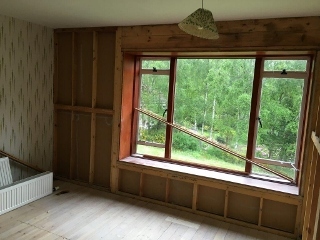 Fortunately, we quickly found a local construction firm, A W Laing, that would not only use local skills, but would go out of their way to understand what we trying to achieve, and use local materials we identified, even where not the “standard” material for the job. For example, whilst Siberian or Latvian larch cladding appears to be the industry norm, local “Scotlarch” from Russwood is increasingly a much more sustainable (knotty and characterful!) very local alternative. Similarly, Scandanavian / Baltic wood flooring seems to be the standard, but, having first checked out the reclaimed flooring options with Hargreaves, Cromartie Sawmill procured and milled us some local larch. This was expertly installed by Laing’s joiners / craftsmen, and transformed into something of real beauty by local flooring specialists, Toncam, using only natural plant-based oils. None of these options were more expensive than the “standard”. 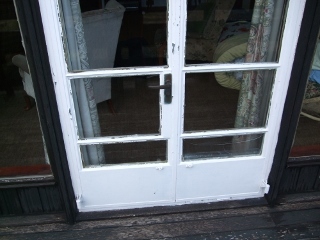 Laings also took on board our concerns about the impact of the work on the bat family living in the eves of the cottage! One of the highlights of the renovation appears to be that, not only was their well-being safeguarded, but they seem to be positively thriving! Perhaps due to the improved shelter some of the thermal improvements provide, at least 8 were counted out at the end of August. You can sit and watch them go out to catch their dinner as the sun goes down! Some of the major improvements are out of sight, but crucial to the comfort of visitors in what can, at times, be a harsh environment. 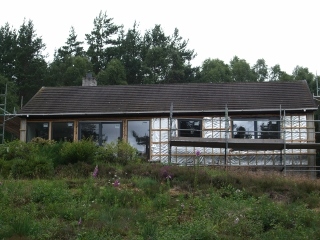 For example, levels of insulation (previously absent) above, below and in the walls behind the local larch cladding, are well beyond current normal spec, which not only reduces the amount of heating required, if any, but also ensures the cottage is still warm in the morning even after the frostiest of nights. All furnishings (sofas, beds, tables, chairs), where not reclaimed / upcycled, were chosen for durability, FSC accreditation and carbon intensity (in production and transport). This has given a new lease of life to some dining chairs from an unfortunate café closure, and led us to gaining beautiful outdoor benches, hand crafted from local larch, from craftsmen less than half a mile down the road! LED lighting installed throughout, and, possibly a favourite installed measure due to the difference made (literally turning night into day or, at least, where the sun doesn’t shine!) 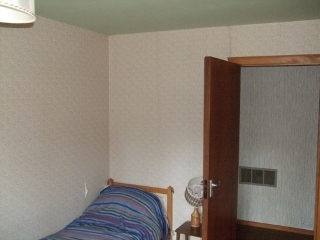 sunpipes built into bedroom corridor and north-facing kitchen. 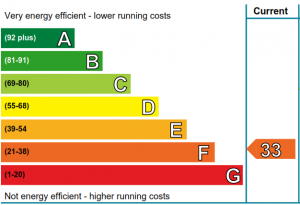 Thermostatically controlled high efficiency boiler system, minimised via wood-burning stove heating option, solar thermal panels for hot water, quality heat-gain windows and hefty insulation. 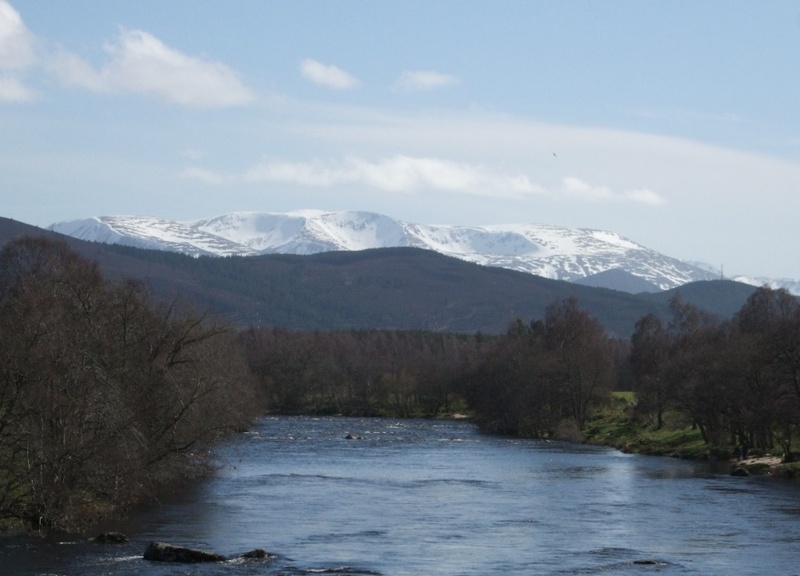 All cleaners, from surface and toilet cleaning, to products provided for dishwasher and hand washing, are chlorine and phosphate-free and based on natural ingredients (they do the job, but minimise any impact in the River Spey!). We buy bulk and refill containers and dispensers. Electricity purchased from Good Energy, so we contribute to their mission of providing a sustainable solution to climate change through renewable energy systems. Banking undertaken with Triodos Bank, so we can even be sure (providing there is cash in our account!) that our bankers only lend to organisations capable of making a positive social, environmental or cultural impact. We have also tried to use recycled materials too, right down to the toilet paper! 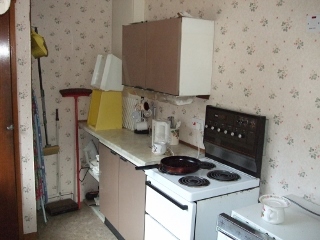 In the spirit of circular economy, A W Laing also bought into the vision of best practice, supplying surplus tiles from another job for the front porch and using larch cladding off-cuts to build into the balcony. As you might expect, waste recycling for guests has also been made very easy as part of the design, ensuring that, ongoing, we don’t send recyclable material to Highland Council’s diminishing landfill sites. Travel on your bikes or feet has also been made as easy as possible, with a bike shelter for security and safeguarding from the elements, and direct gated access to the forest behind the property and a huge range of walks (added freedom feels great, after years of leaping a deer fence!). Local food, culture and activity options are also highlighted for you, if you wish to buy into some local community action / hospitality while you’re here (but options too plentiful to list here – you’ll have to visit to immerse in the options!). Similarly, it goes without saying that there is a huge variety of outstanding nature and wildlife opportunities, which our cottage information will help you access, if you don’t have your own adventure already planned. These extend, literally, from seeing red squirrels, deer and an amazing array of birds from the comfort of the sofa or balcony (a Golden Eagle has been seen touching down in the garden – once! We can’t guarantee that unfortunately!! 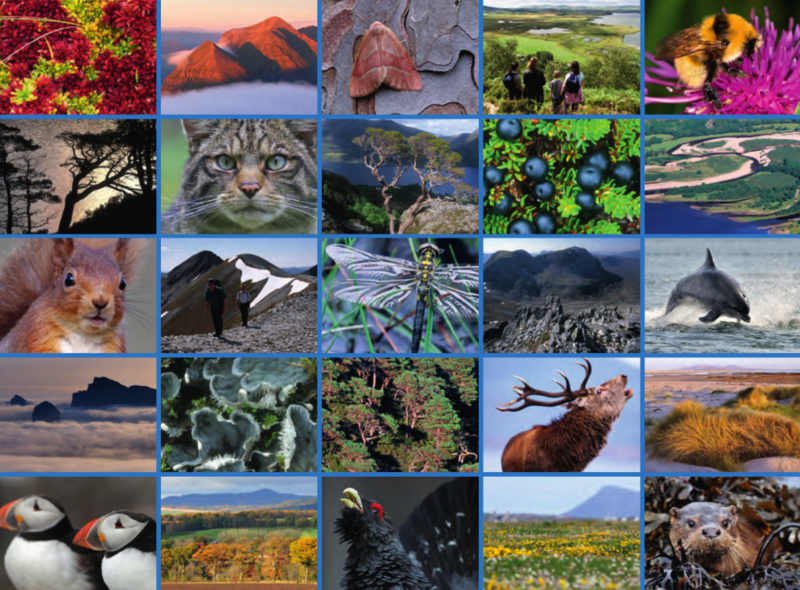 ), to local salmon and capercaillie trails, and wider to the mountains, lochs and swathes of Ancient Caledonian Forest.